Is Your Recycling Bin Lying to You? Madeleine Edwards of Get Green Recycleworks drops off some recycling at ReCommunity, Memphis' primary sorting center for recycling that no longer accepts business recycling. Janet Addison is peering into a large, blue recycling bin on the University of Memphis campus. She does not like what she sees. “Okay, right now, everything that’s in here is contaminated,” says Addison, who’s been working as a recycling operator for the university for almost two years. By contaminated she means that along with recyclable items —bottles, papers, cans —there’s also plenty of gunk. “We do not want half of your hotdog, half of your food, or half of your Starbucks,” Addison says, scanning this recycling dumpster, next to a student dorm, to see if anything is salvageable. She pulls out a bag of clean clothes. Not recyclable in the traditional sense; she’ll drop it off at charity after work. The rest is all contaminated. Keeping recyclables clean is a growing problem for an industry already reeling from a declining demand for product. It's also the main reason given for why Memphis’ primary sorting facility for recycling, called ReCommunity, no longer accepts most commercial recycling. ReCommunity is owned by the national waste management company Republic Services. Drew Boyer, the company’s general manager in Memphis, said in an email that he did not know how many customers were affected by its recent policy change. But their numbers include U of M, St. Jude Children’s Research Hospital and Memphis International Airport. These three institutions combined generate 35 tons of recyclable waste per month, the majority of which is now going to a landfill. Amelia Mayahi, sustainability manager at U of M who started its recycling program, says institutions like hers are scrambling for a solution. Even some institutions were unaware that they lost the option to send their recyclables to ReCommunity. 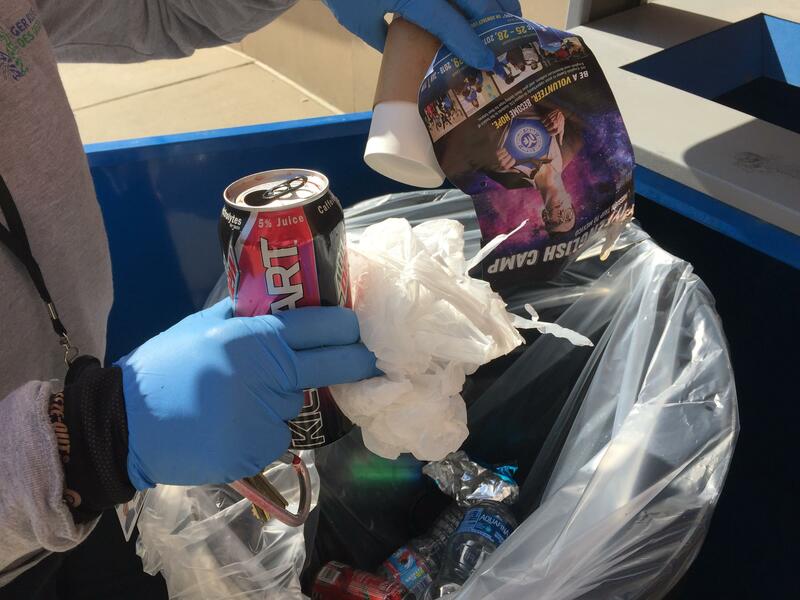 UT Health Sciences Center found out their garbage wasn’t being recycled only after WKNO asked about it. In one statement, Republic Services said they cut off commercial customers because of the same problem Janet Addison faces daily at the university: contamination. Janet Addison, a recycling operator for the University of Memphis, fishes a plastic bag out of a recycling bin. Plastic bags contaminate other recyclables. Contamination is a widespread problem in single stream recycling, according to Bernie Lee, an analyst for the trade association, the Institute for Scrap Recycling Industries. Single stream recycling is the common method used in Memphis, where papers, metals, plastics and glass are all tossed together into the same bin. “Some of these items contaminate each other, even though they are perfectly recyclable on their own,” Lee says. He gives an example of glass breaking into shards, which wind up in loads of paper shipped to paper mills, where the glass fouls the machines. Half-empty soda bottles that recyclers plop into bins assuming they are doing their part can do more harm instead, Lee says. People also do too much of what Lee calls “wishful” recycling, where someone assumes a product should be recyclable without checking to see if it’s acceptable. Used paper diapers, Lee says, have ended up in bins because people think the paper is reusable. The bottom line is that buyers want clean recyclables and it takes either expensive technology or many hands to separate all that single-stream recycling at places like ReCommunity, where materials are sorted and shipped back to manufacturers. There's an economic hitch, as well. Last year, China, a major buyer of the world’s recyclables, increased quality standards for imports and banned dozens of others. Boyer said the new purity standard is difficult to meet. Republic Services has gone from sending 30 percent of its recyclables to China to less than one percent. The drop off means more local recycling is going to the dump. Republic Services also owns two landfills in Memphis. The company did not respond directly to the question of whether it was a conflict of interest to manage both a recycling center and landfills. There’s still no solution at Memphis International Airport, says spokesman Glen Thomas. At St. Jude, which collects 25 tons of recycling per month, sustainability manager Kevin Krueger says he’s looked for a workaround, such as trucking recyclables to Nashville or Little Rock. But that gas comes with a big carbon footprint, he says, so Memphis just needs to figure out more recycling options. “I do hope to see, you know, maybe a coalition of local institutions and organizations where we can pool our demand,” Krueger says. So what about all those residential bins that generated 20,000 tons of recyclables last year? That’s still being sorted by ReCommunity thanks to the City of Memphis’ contract for residential recycling, which expires in three years. Philip Davis, the city of Memphis’ interim director of solid waste division, says that given problems with contamination, residents should focus on keeping their recycling clean. No Styrofoam, for example. And the biggest no-no: plastic grocery bags. “The cleaner the commodity that can be provided to the materials recovery facility, the more valuable it is,” Davis says. At the university, Mayahi is in a tough spot. She isn’t too eager to broadcast the recycling crisis because while she looks for a solution, she wants students to remember that ultimately, recycling is the right thing to do. “I don’t want anyone to get discouraged about it and to stop recycling,” she says.